Kolkata Knight Riders have lost their last two matches now against Chennai Super Kings and then Delhi Capitals, so they will be keen to get back to winning ways on home turf against the Super Kings here. Chris Lynn and Sunil Narine both missed the match against the Capitals last time out but there is hope that both will be fit to return in place of Joe Denly and Carlos Brathwaite, which should boost them although they will be keen to ensure Shubman Gill remains high in the order after playing well as he was promoted to number four. They may also decide to bring Harry Gurney back in for Lockie Ferguson who has not quite found his best form yet, while there is a question mark over star man Andre Russell so do not rule out him being rested for this match. Chennai Super Kings are coming off their sixth win in seven matches on Friday as they edged past Rajasthan Royals, but they will do well to maintain this momentum as they are facing their second game in a mini series of four matches away from home. They rested Harbhajan Singh in the match against the Royals but they could decide to bring him back in for Imran Tahir to give him a rest, while it is possible that some of their other veterans – and potentially even Dhoni – could be handed a surprise rest here or at some stage soon. Shane Watson’s form is a slight concern so he could potentially be withdrawn to take a break but there is very little to question about the Super Kings right now as they continue their superb form and only fatigue or possibly complacency could be a factor. Chennai Super Kings comfortably won the reverse match in Chennai just five days ago but this could be extremely different on a track which should favour batsmen far more than the sticky track in Chennai. Kolkata have lost their last two which will be something of a concern with the teams around them hovering. Their pride will have been damaged by the loss to Chennai last week, and they will be desperate to bounce back on home turf. 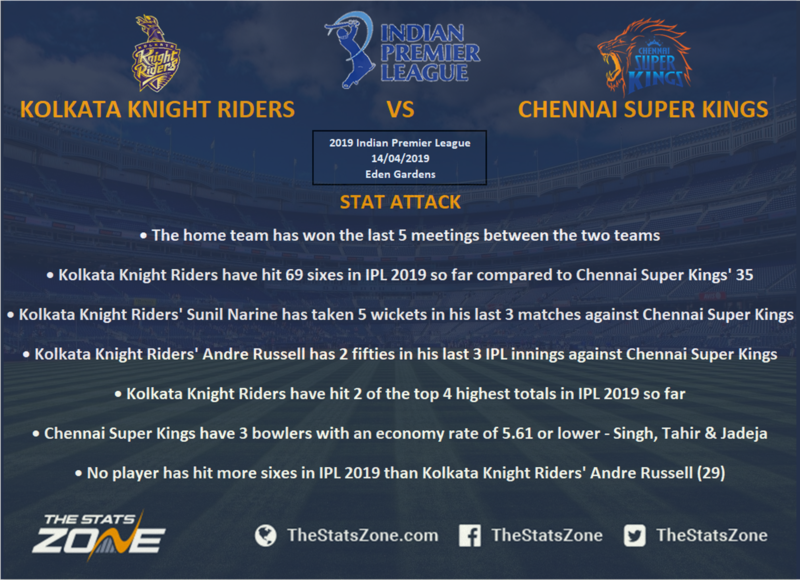 It is tough to oppose Chennai and MS Dhoni, but fatigue could harm them a touch here and the Knight Riders can bounce back to winning ways in this one.